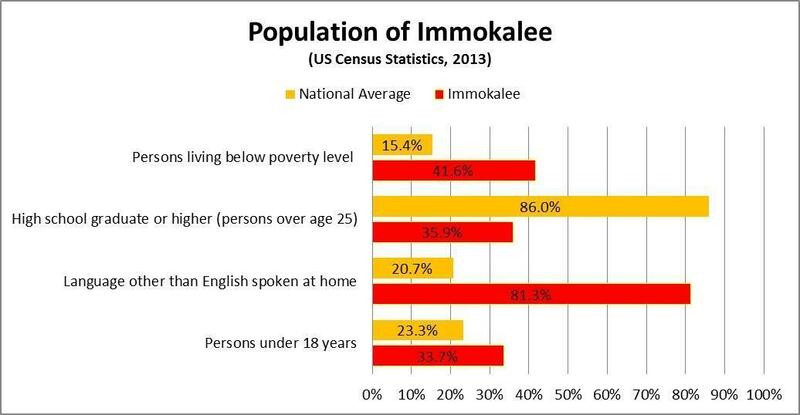 Immokalee is a Seminole Indian word that means “My Home”. Immokalee, FL is an agricultural community that sits on the outskirts of Collier County, approximately 25 miles from Naples. An estimated 25% of the nation's citrus produce and over one third of the nation’s tomatoes are grown in Immokalee. The median family income is $24,098; less than half the national median family income of $53,046. Only 3.5% of residents over age 25 hold a Bachelor’s Degree in comparison to nearly 30% nationwide. The median age in Immokalee is 25. 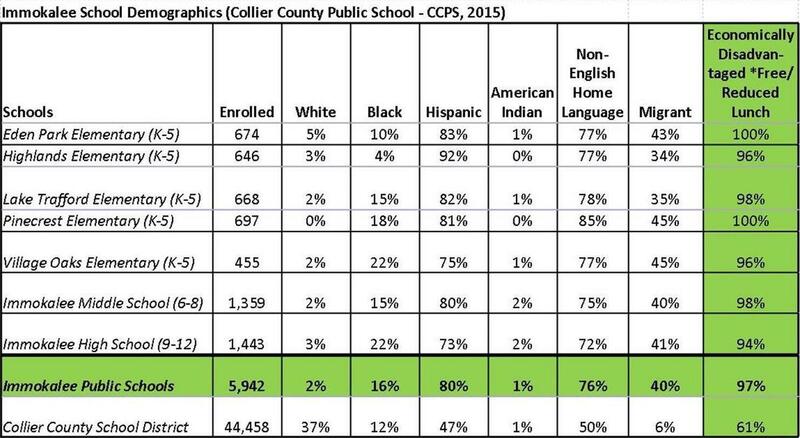 An estimated 35% of adults over age 25 in Immokalee have no more than a ninth grade education, compared to the low national average of just 5.8%. The statistics of Immokalee are embodied in a student population that struggles with academics from the moment they enter kindergarten. A staggering 97% of students in Immokalee’s public schools qualify as economically needy. The vast majority of these students come from homes where English is not spoken, with adult family members generally having had little if any formal education. These students face an uphill battle with extreme poverty, second language acquisition, and lack of much needed support. This highlights the incredible need for academic remedial support in the community. A mere 35% of adults in Immokalee age 25 and older have completed their high school education, and only 3.5% of those over 25 have bachelor’s degrees, both well below state and national averages. This data highlights the critical need to support the students of Immokalee through high school and college graduation and mitigate the risk factors by providing mentoring and guidance to its disadvantaged youth. The Guadalupe Center believes that the most effective way to break this cycle is by providing Immokalee’s students with high-quality academic programs that will offer them an opportunity to succeed. The Guadalupe Center offers the help that the children of Immokalee desperately need. For these children, the dream of a college education seems far-fetched. Though the Guadalupe Center’s programs, students are prepared to begin kindergarten performing on or above expectations and elementary students receive the support they need to perform on grade level. High school students are empowered and prepared for college and college students given financial and emotional support and guidance to ensure they graduate with degrees. Together we are breaking the cycle of poverty through education, and transforming children’s lives.